There's a whole bunch of Mayberry happenings to report. We'll start with upcoming events. The Andy Griffith Museum, featuring the amazing collection of Andy Griffith artifacts started by the late Emmett Forrest, is now celebrating its completed renovation as of June 29. 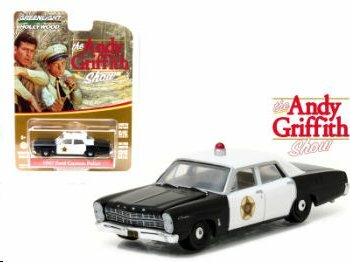 The museum is open daily in Mount Airy, N.C. For info, visit the website at www.andygriffithmuseum.org or call (336) 786-1604. ROCKER OF AGES--Just a taste of the opening section of the totally remodeled Andy Griffith Museum. Photo by Hobart Jones. The Andy Griffith Museum has just completed a major remodeling that now provides a truly beautiful, state-of-the-art home for its impressive collection of Andy Griffith artifacts. The museum reopened on June 29. In a scenario that only Count Istvan Teleky could make happen, the first visitor after the reopening was Andy Mayberry and his family from Arkansas. COUNT ISTVAN TELEKY EXISTS!--Andy Mayberry and family prepare to enter the renovated Andy Griffith Museum. The family honestly just happened to be passing through town the day the museum reopened! Read more about the remodeling effort HERE. This informal gathering is being coordinated by Allan "Floyd" Newsome as a chance for fans to visit and enjoy Mount Airy during a quieter time of year than with the wall-to-wall activities and crowds of Mayberry Days (also not to be missed!) in September. There's a loose schedule of planned activities that folks can pick and choose from. It's mostly just a chance to hang out and relax in Mount Airy with fellow visitors and local friends. Click this link for the Mayberry Motor Inn website for room reservation info. The motel and its gazebo serve as the home base for weekend. Visit the Meet-Up's Facebook page for more info. * July 29: David "Mayberry Deputy" Browning and Dorothy Best (wife of the late James Best) join a host of "Dukes of Hazzard" starts and others at Cooter's Last Stand in Luray, Va., from Noon until 5 p.m. For more info, visit www.facebook.com/events/2049307201960056/. * Aug. 5: Mayberry Night in Troy, N.C., starring Maggie Peterson, the VW Boys and most of the Mayberry tribute artists in a fundraiser show for the local DARE program. Dixie Griffith (daughter of Andy) will also be a special guest. Showtime at the James Garner Center is 7 p.m. Reserved seating is $20, General Admission tickets are $15 and admission for kids ages 6-12 is $10. For advance tickets or info, contact organizer Jeff Branch at jbranch205@gmail.com or (704) 985-6987. Also booked to perform are the VW Boys, Michael Hoover and his "Memories of Elvis" show, the Malpass Brothers, Balsam Range, The Tams, The Lisemby Family and James Gregory ("the funniest man in America"). Neal Brower will also be presenting his popular Professor Brower's Lecture. Many more guests and details TBA. For more info, visit www.mayberrydays.org. Tickets are already available for several performances and activities. OPIE-WAN KENOBI?--It was big news for Lucasfilm to hand solo responsibility for directing the Han Solo Star Wars film to Ron Howard midway into production. Ron Howard has been brought in mid-filming to save the new Han Solo Star Wars film, which had gotten off course (that is, too snarky) with its previous directing team. There's a general consensus that Han will be in very good hands with Ron. The film is still slated for release during Memorial Day Weekend 2018. Ron is also set direct a documentary about the life of the late opera legend Luciano Pavarotti. Imagine Entertainment and other partners from the Grammy-winning The Beatles: Eight Days a Week--The Touring Years documentary (also directed by Ron) return to produce this one. Just last Thursday, it was announced that Ron is an Emmy finalist for best documentary or non-fiction special for the Beatles documentary. In late June, Ron announced that Pablo Picasso will be the subject of the second season of "Genius," which Ron is executive-producing for NatGeo. The first season, which was about the life of Albert Einstein, earned solid ratings and nice reviews worldwide. Ron is also nominated for an Emmy in the Limited Series category for his direction of the premiere episode of the series. The current asking price for Ron's apartment in the Eldorado building on Manhattan's Upper West Side (3-bedroom, 2.5-bath unit with a private elevator) is $11.5 million. That's reduced from the original price of $12.5 million. Clint Howard has several films that are either wrapping up editing or about to start production. And it wouldn't surprise followers of the Nashville-based "Still the King" TV series to see Clint return as Crazy Dave at some point. And we're late reporting that Rance's wife, Judy, passed away in January of Alzheimer's. Judy was a noted journalist, playwright, and novelist. She and Rance were married in 2001, after both her first husband and Rance's wife Jean (mother of Ron and Clint) died the previous year. Survivors, besides Rance and other Howard family members, include two daughters from Judy's first marriage and four grandchildren. The sympathies of Mayberry are with the family. Betty Lynn was the subject of the cover story of the June issue Mayberry magazine, the inaugural issue of the entertainment and tourism publication for Mount Airy, N.C., where Betty lives. Betty's next day to greet fans at the Andy Griffith Museum in Mount Airy is July 21. And later this month, she'll be participating in a sold-out lecture with Neal Brower for a specialty tour group at the Andy Griffith Museum. Maggie Peterson joined TV brother Rodney Dillard and his band (plus David "Mayberry Deputy" Browning) in early May for their Mayberry Moments show in Duluth, Ga.
Elinor Donahue was a featured guest at the Hollywood Show, a celebrity-greeting and memorabilia event in Los Angeles earlier this month. Other stars with TAGS connections at the show were Charles Dierkop (Larry, one of the crooks in "Otis the Deputy") and Kellie Flanagan (new Mayberry arrival Claudia Campbell in "Opie and Mike," Episode 247). Kellie is now managing editor of Sierra News Online. You can read a recent story about her HERE. Margaret Kerry (two TAG episodes) and Alan Oppenheimer (Mr. Ruskin in "Barney Hosts a Summit Meeting," Episode 240) were guests for the Fanboy Expo in Knoxville, Tenn., in late June. GOOBER SAYS HE-MAN!--Michael Lowery (left) of Mayberry chapter visits with Alan Oppenheimer at the Fanboy Expo. Photo by Dennis Beal. Julie Adams (Nurse Mary in "The County Nurse," Episode 56) also recently made a comic-book convention appearance. Hers was closer to home at the San Fernando Valley Comic Book Convention on June 4. In a recent "Talk with Jackie" column in The Tolucan Times, Jackie Joseph-Lawrence (Mayberry's Sweet Romeena) writes about adventures that she and husband David Lawrence have had, including an interesting cruise to Bora Bora last year. George Lindsey's alma mater, the University of North Alabama, is in the process of trying to complete funding of the George Lindsey Film and Media Endowed Scholarship at the university. It is an effort that TAGSRWC, Weaver's Department Store and other Mayberry groups and individuals have been supporting. Dorothy Best (wife of the late James Best) starred in a recent production of Neil Simon's Chapter Two at the Hickory (N.C.) Community Theatre. It is with great sadness that we share news of the passing of George Spence, a wonderful friend to countless in the Mayberry community. George died on July 13 at home in Kill Devil Hills N.C., with his wife, Stephanie, by his side. He was 89. George was beloved by legions of Mayberry fans, especially those who attend Mount Airy's annual Mayberry Days festival, which he began attending in 1996 and continued to do, as long as his health allowed, which was for most years through 2013. A GLORIOUS MOMENT--George as Frank, the fiancé in "Guest in the House." George's one episode of TAGS was "Guest in the House" (Episode 151) in 1965. He played Frank, the temporarily estranged fiancé of Andy's "cousin" Gloria, in one brief scene and then the epilogue, which is rarely seen in reruns. But George made the absolute most of his pivotal scene, which included one line ("Hi ya, Glory. "), a kiss, and an embrace. That was all it took for George to be included among Mayberry royalty. George loved to tell the story about how director Coby Ruskin didn't want a rehearsal of the kissing scene. As George told it, "I thought we were going to have to kiss five times in rehearsal. Then, I'll probably mess up and have to kiss her 10 more times." George got it right in just one take. Ruskin commanded, "That's a cut. That's a wrap." Andy was off to the side busting a gut laughing. He came over to George and said, "That's the toughest thing you have to do in film, And you did it in one take." Not missing a beat, George replied, "Andy, I've been kissin' girls all my life." The stuff of legends. But to know just George's one memorable scene in TAGS is to miss the fullness of his life and his contributions to many communities. George Jones Spence Jr. was born in Elizabeth City, N.C., on April 18, 1928. He was the son of George J. and Pearl Kellam Spence. He grew up around The Lost Colony, the famed outdoor drama on Roanoke Island, N.C. George even attended shows in the first two seasons of the production (1937 and 1938). It was from that exposure George got the acting bug. He began playing Lost Colony villain Simon Fernando while in college in 1948. (He received his degree in English from Wake Forest University in 1951 and did further study in Theater at the University of North Carolina at Chapel Hill.) Among his fellow Lost Colony cast members for several years was Andy Griffith. OLD FRIENDS CAST TOGETHER AGAIN--George and Andy Griffith pose with the TV Land Landmark statue following the unveiling ceremony during Mayberry Days in Mount Airy in September 2004. George would return to play other Lost Colony roles in the 1970s and again in the early 2000s. Along the way, George was involved in over 100 productions, as both a performer and often as set designer or producer and, even more often, as director. George was also a gifted teacher. He taught drama at A.L. Brown High School in Kannapolis, N.C. He took time off from full-time teaching to earn his master's degree in Speech and Drama from Florida State University in 1960. He returned to North Carolina to be assistant professor of Drama and serve as department chairman at Lenoir Rhyne College in Hickory. 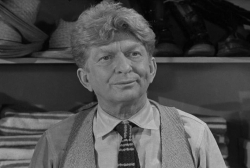 George spent a short time in Hollywood in the mid-1960s--just long enough to make his mark in Mayberry. (You might also spot him in an episode of "Rawhide" and two episodes of "Combat.") He then returned to teaching, this time at East Tennessee State University in Johnson City, Tenn., where he was an associate professor of Drama for five years. FACES IN HOLLYWOOD--These are head shots for casting that George used during his time in Hollywood in the mid-1960s. George next taught Drama in high school again (Sanderson High School in Raleigh, N.C.) and then worked for the historic preservation board in St. Augustine, Fla., for a time before eventually returning to the Outer Banks of North Carolina, where he called home from 1973 onward. PREPARED FOR ANYTHING--George in his official capacity for Dare County civil service. George was a strong advocate for developing the area's reverse osmosis water treatment networks--a practical system still in use today and a vital part of Dare County being able to provide enough clean water to keep up with demand during years of booming population and tourism growth. Amid all of his educational and civil-preparedness contributions to the communities where he lived, George remained very involved in acting and directing, including some film work (such as the Jury Foreman in the "The Hunting Party," a "Matlock" two-parter filmed on the Outer Banks in 1989), but mostly for the theater. During his career, George produced shows with Richard Boone and even directed John Carradine in The Merchant of Venice. TWO GRAND FELLAS--Mount Airy barbering legend Russell Hiatt ("America's Barber") and George visit outside the Andy Griffith Playhouse during Mayberry Days 1999. But it was for his return to Mayberry in the 1990s that fans are probably most appreciative of George, because that's when most fans first got to know him and wife Stephanie, who was always by his side. Whenever George was in a room or on a stage, there was no missing him. He had a commanding presence, punctuated by his booming, rich baritone voice. (His everyday speaking voice was like Gomer Pyle's singing voice!) There was no need for a microphone to hear George all the way in the back of an auditorium or even an amphitheater. In a profile about George some years ago, a writer described George as a "Renaissance man" of the Outer Banks. And it's true. 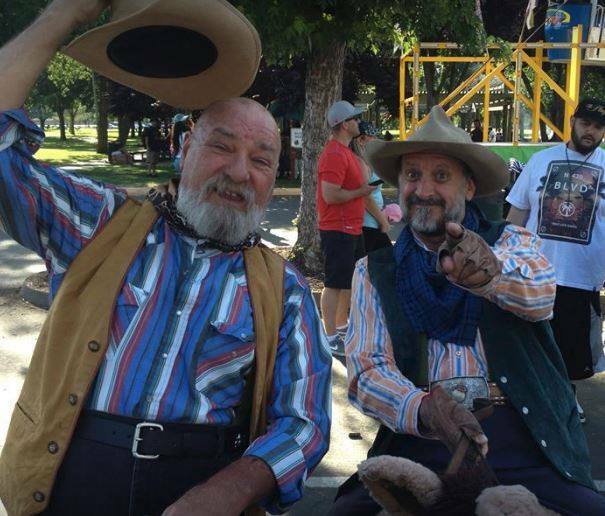 George was an accomplished performer, a longtime educator and a devoted public servant. Through it all, George was incredibly humble. He knew better than almost anyone else could ever know what an amazing gift it was to have been on TAGS--even for just a few moments. He embraced every minute of being at Mayberry Days and shared his gratitude with fans. 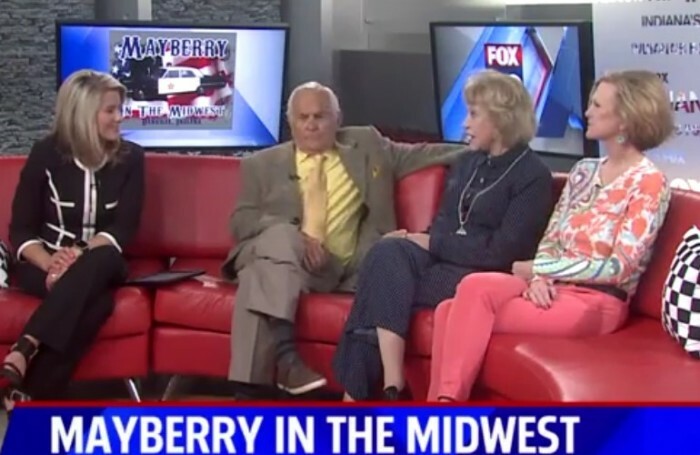 Mayberry Days is a celebration of many wonderful people, values, feelings and relationships. George represented all of them. And he always will. George and Stephanie Spence at what would be his final Mayberry Days visit in 2013. Family was foremost for George. In addition to wife Stephanie, survivors include son Jamie and his wife, Nam Sayavong; daughter Shannon Dudley and her husband, Rolfe Dudley; and four grandchildren, all of Kill Devil Hills. A memorial service will be held at 2:00 p.m. on Sunday, July 23, at Kitty Hawk United Methodist Church with the Rev. Betsy Haas officiating. Here is a link to George's official obituary. No new chapters have started since our report of the newest three in the May eBullet. We currently have had 1,450 chapters founded since TAGSRWC started 38 years ago. "WILL YOU HELP US?" Yes, we will! Starting a chapter is easy and fun! Starting a chapter of TAGSRWC is easy to do. Just pick a name that hasn't already been selected by another group. You can check the searchable list of chapter names already taken at www.tagsrwc.com. Then submit the name with a list of your founding members by e-mail (to Goober@imayberry.com) or by U.S. Mail to TAGSRWC's HQ (118 16th Avenue South, Suite 4, PMB 146, Nashville, TN 37203-3100). Just released this month, the 2018 wall calendar is 12 in. wide x 12 in. tall when closed and 12 in. wide x 24 in. tall when open. Since our May issue, we've also added four new T-shirt designs, two new tote bags, and two new accessory pouches, plus a new throw pillow, fleece blanket and woven throw. Most of our adult-sized T-shirts are just $20. (A few designs are $18, and the Lawmen all-over design is $25.) We also have caps, Goober beanies, deputy badges and deputy patches. And we have a new bumper sticker and a sheriff's emblem sticker. Brand new. Just released last month! 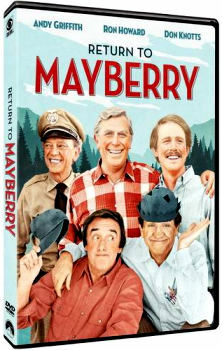 This is the first time the 1986 Return to Mayberry movie has been released on DVD as a stand-alone product. Mayberry chapter (Knoxville, Tenn.) has been busy as usual with monthly events, including parades with their Mayberry squad car replicas and regular chapter outings and meetings (often celebrating a cast member birthday with cake!). Their most recent parades were the 32nd Annual Dolly Homecoming Parade in Pigeon Forge (with Dolly Parton herself!) in May and the Fourth of July Parade in Farragut, Tenn.
Chapter members also enjoyed visiting with TAGS cast members Margaret Kerry and Alan Oppenheimer at Knoxville's Fanboy Expo in June. And the chapter has just published its Summer 2017 edition of their Mayberry Minutes newsletter. There have been so many goin's-on to participate in that they've had trouble finding the time to stop and report and publish, but they finally went to press last week. Another big summer gathering was held on July 2. That's when "Blood Brothers" (Marceline, Mo.) got together at high noon for a chicken and fish fry. The group conducted a little chapter business and discussed "Barney's First Car." Then they enjoyed a presentation about classic cars by Robert and Gerry Gerti (kneeling in front in the photo below), owners of the award-winning 1933 Ford coupe and 1951 Ford Custom (also pictured). NEIGHBORS, HOODS IN THE WOODS--Car hoods, that is, not the nice people. They're not hoods. They're "Blood Brothers." Members of Barney chapter (Greensboro, N.C.) attended fellow chapter member Neal Brower's lecture at the Andy Griffith Museum on July 8. The group also continues to meet monthly for fun and games...and good food! See Floyd's event calendar (above) for info and links about the 5th Annual Mayberry Meet-Up being held in Mount Airy on July 21 and 22. And the weekend after that, chapters and fans at-large from Indiana and beyond will get together for the regular monthly visit at the Mayberry Café in Danville, Ind. July's gathering is on the 29th at 2 p.m. Y'all come for good food and good fellowship! The next eBullet is the pre-Mayberry Days issue planned for September, and the next Weaver's Newsletter is scheduled for August. HOMETOWN PRIDE--Here's one more glimpse inside Mount Airy's renovated Andy Griffith Museum. In the words of a favorite Mayberry visitor: "It's a real bobby-dazzler!" Photo by Hobart Jones.